Generous gardeners unite to fight hunger - Neighbors Inc. The tomato is one of the most universal vegetables in the world. OK, it’s technically a fruit but it’s commonly called a vegetable in cooking. This juicy red fruit (happy?) is grown and eaten on nearly every continent and is enjoyed raw, or pureed into a variety of sauces, salsas and pastes. It is also one of the most commonly over-planted varieties of produce, often sowed in abundance by over-eager gardeners blinded by visions of a thick-sliced beefsteak on their grilled burger, or bright red cherries tossed in their summer salad. Unfortunately, come harvest time, scores of tomatoes are seen dying on the vine in local gardens. This produce is not alone. According to AmpleHarvest.org, a nonprofit dedicated to fighting hunger and eliminating fresh food waste, American gardeners annually generated 11.4 billion pounds of food waste. The organization conducted a study in 2015 and 2016, asking more than 2,500 gardeners nationwide two key questions: how much more food do you grow than you can use, and would you be willing to donate the excess to a nearby food pantry if you had the opportunity? The results were startling. The study revealed that the amount of homegrown food not consumed is large enough to favorably change national food waste totals, and the number of gardeners willing to donate produce can significantly improve national statistics on hunger in America. According AmpleHarvest’s study, more than 50 million people in the United States live with food insecurity – meaning they may not have enough food for their family – and Americans waste about 126 billion pounds of food annually. AmpleHarvest is on a mission to encourage gardeners to lend their green thumbs to the cause by regularly donating unused produce to their local food shelf. Area food shelf managers report that they commonly get ample supplies of canned fruits and vegetables but wish they would receive more fresh produce. Sara Keis, communications director at Neighbors, Inc., 222 Grand Ave. W., South St. Paul, said garden-grown produce is in high demand and flies off the shelves. When donating, she simply asks gardeners to remove the dirt, and to leave spoiled produce at home. She also said it’s helpful to label items that may not be readily identifiable, such as herbs. Bring produce that you would eat yourself. It should be free of mold, decay and insects, and have a shelf life of 3-5 days. Pack it in cardboard boxes or other sturdy containers to prevent bruising or damage. Produce should be grown and harvested in an environment free of contaminants. Kate Panning, food market coordinator at the Neighborhood House Food Shelf, 179 Robie St. E., St. Paul, said fresh produce donations are much appreciated by their patrons. The most popular are onions, tomatoes, cucumbers, corn and fruit. The least popular? “Kale seems to be the one thing that doesn’t go very quickly,” she said. This food-sharing trend has roots extending to the Plant A Row for the Hungry campaign, launched in 1995 by the Garden Writers Association of America. The program is simple. Local gardeners are asked to plant one extra row of fruits or vegetables in their gardens and donate that produce to their local food shelf. 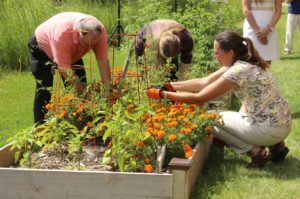 In 2013, First Presbyterian Church in South St. Paul jumped on board and transformed unused land into an organic garden. It rents 19 plots to its members and neighbors to grow nutritious food for their families, and uses eight plots to grow vegetables for the food shelf at Neighbor’s Inc., and to sell at its Sunday morning farmers’ market. Last year, the program donated 1,187 pounds of organic vegetables, and $844 from proceeds of sales at the market. Dakota County Master Gardeners use a quarter of the garden to test seeds, and about half of the vegetables donated to the food shelf come from their plot. issues in the neighborhood. The group hosts the Beans on the Boulevard project, which provides supplies to grow food that is shared with others in the community. Participants receive free pole bean seeds, a 6-foot rebar structure on which to grow the beans, and compost. In return, the gardeners agree to tend the mini gardens and share the produce. Growing West Side also operates a seed library 4:30-6 p.m., Wednesday and 1-3 p.m. Saturday at the Riverview Library, 1 E. George St., St. Paul. Gardeners may take three packages of free seeds per visit. The library also offers gardening resources and advice on seed-saving techniques. Those using the program are encouraged to contribute seeds to the library at the end of the season. The group will host its annual plant sale 9 a.m.-1 p.m., Saturday, May 12 at Icy Cup, 63 W. George St. The sale features starter plants and more. For more information, visit www.growingwestside.com.